ASPEN ” It’s winter and it’s time to drink boldly. While Sauvignon Blanc and Chardonnay make for great summer sipping, when the temperatures drop and the snow begins to fall, turning to the dark, red wines that pair so well with rich hearty foods is one of the delights of the season. Fortunately, you’re here in Aspen, a place where wine lists are stocked with gems from around the world that are well-suited for those cold winter nights when braised meats, autumnal vegetables and savory stews are the perfect way to end a day on the slopes. For these kinds of foods, big wines go best. When selecting wines for winter drinking, the grapes that suit the season are those with dark, rich and fruity flavor profiles that warm the soul as they complement the dishes. Sitting down for dinner with a wine list at say, DishAspen, Montagna or L’Hostaria, I usually turn straight to the red wine section and look for wines made from California Cabernet Sauvignon, French Syrah or Australian Shiraz, and the great Brunello di Montalcino from Tuscany. To help you get your bearings, let’s look at the origin of these varietals and some of the wines made from them that you can find on local wine lists. “Cab,” as it is casually called, is the most popular varietal in America. Since the middle 1960s it has become the definitive grape for fine wine from the Napa region of California and the American wine that the rest of the world both knows best and respects most. Cabernet Sauvignon is a “Bordeaux varietal” meaning it is one of the five grapes grown and used in the great Bordeaux wines of France. Genetically the grape has its origins as a cross between the dark grape Cabernet Franc and white Sauvignon Blanc grape. The consummation of the marriage has given us a child that outshines the parents. Wines made with Cabernet Sauvignon are characterized by their full flavor with essences of black currant, green pepper and a healthy dose of tannins. In the hands of a good winemaker, barrel aging to include smokiness and hints of vanilla can augment these flavors. California Cabernet Sauvignons, from the Napa Valley in particular, hold positions on the wine lists of just about every serious restaurant in this country. At DishAspen, the 2003 Cakebread Napa Valley Cabernet Sauvignon is a perfect companion for Chef Matt Zubrod’s bacon-wrapped beef filet and a sublime example of a classic California Cabernet. Perhaps no other grape has made such a sizable impression, so quickly, on the world of wine than Syrah. Over the past decade, the Australian wine market has exploded with Syrah, called Shiraz by the Aussies, being the dominant reason. Syrah is the most widely grown grape in the Northern Rhone region of France. In its finest form the wines made from Syrah are intense, with a deep, dark, purple color. They are big and chewy and can be highly charged with alcohol. If your pockets are deep and you want to taste the best expressions of the French version of the grape head to Montanga in The Little Nell hotel. There, Master Sommelier Richard Betts has armed his list with some of the legendary “Hermitage” releases from master winemaker Jean-Louis Chave. 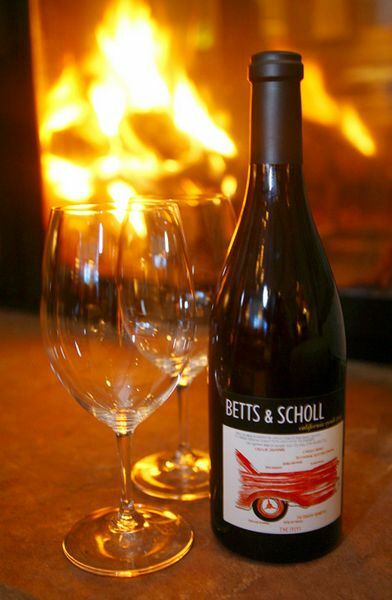 Betts is so enamored with the region that he and his partner, Dennis Scholl, have worked with Chave to produce 250 cases of their own Syrah from the slopes of Hermitage. The 2004 Betts and Scholl Hermitage can be enjoyed with Chef Ryan Hardy’s Tuscan seared prime beef ribeye with creamed Tuscan kale, balsamico and crispy onions at Montagna. Australian Shiraz, particularly that from the southeastern portion of the country, has become the go-to wine for lovers of red meats. The hot-climate, high-alcohol wines from the Barossa Valley show finesse while packing a punch. A great example of Australian Shiraz from a great winemaker can be found at Syzygy, where a number of different vintages of Jim Barry’s legendary “The Armagh” hold prominent positions. Born in the Clare Valley, just north of the Barossa, these wines complement Austrian Chef Martin Oswald’s Oven Roasted Elk Tenderloin, with Fresh Horseradish Mashed Potatoes, Morel Mushrooms and Red Currant Sauce for an international dish of epic proportions. L’Hostaria is a local’s favorite and a must-stop for savvy visitors, especially from Italy, who long for the authentic tastes of their home country. Owner Tiziano Gortan has a compiled a wine list that celebrates bottlings not just from his home region, near the city of Udine, but from up and down the boot. A prized place on the list features the Brunello di Montalcino of Tuscany. These wines are made from the Sangiovese Grosso grape, one of the wine world’s wonders and produced in very small quantities. As a result Brunello di Montalcino does not come cheap. Brunello is aged for a minimum of two years in oak casks before release and they can age for years in bottle before being ready to drink. Decanting this big wine is highly recommended. It is an excellent wine with food and a bottle of the Tenuta Friggiali Reserva, Brunello di Montalcino 1997 opened with L’Hostaria’s Milanese-style Osso Bucco is the closest you will get to Italy without an Alitalia boarding pass. There are other great grapes for winter drinking ” Grenache, Zinfandel and Merlot will all soothe the senses ” and there are a plethora of great places to sip and sup in this town all winter long. Just remember to ski hard and, of course, drink boldly.